Bright, cheerful, creative and fun describe this adorable “Key West” style beach cottage. 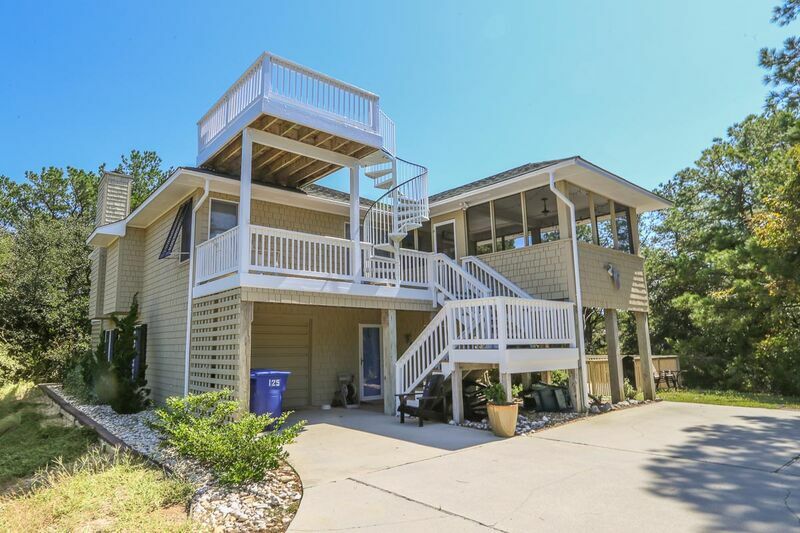 The colors and “beachy” décor make this home a wonderful place to bring the family for the perfect Outer Banks vacation. The cozy setting will make you wish you could stay forever. Enjoy your morning coffee up high on the crow’s nest deck or sip a chilled beverage in the warm evenings while soaking up the amazing ocean views. 2 bedrooms (1 with Queen with CATV/DVD player and 1 with Twins with CATV/DVD player; full bath, den with CATV, DVD player; laundry; storage room with full size refrigerator. 2 master bedrooms (with Queen); living area with living room furniture, 32" LCD flat screen CATV DVD/VCR player and with ocean views; well-equipped kitchen with granite countertops; dining area; hardwood floors; crow’s nest, great decks. Fireplaces, if available for tenant use, are available 10/15-4/15. Errors: Every effort has been made to ensure all descriptions and photos are accurate, however Southern Shores Realty is not reponsible for changes or errors in rates, furnishings, bed arrangements, and equipment, or for down time of inoperative equipment. Enter your desired arrival and departure date to the right to get a quote or make a reservation. By submitting this form you allow us to store your information for validation purposes only. Copyright © 2019 Southern Shores Realty. All Rights Reserved.